On this day in 1940, the NHL board of Governors eliminated the requirement that only jersey numbers 1-19 be allowed to designate players in NHL games. This opened up a can of worms that we're not sure the Board of Governors anticipated at the time. 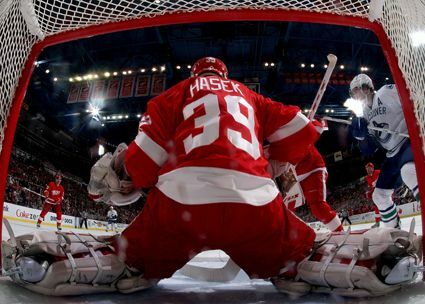 Traditionally, goaltenders always wore #1, while the defensemen commonly wore numbers 2 through 6, a tradition that continues to this day. Traditionally, goalies always seemed to wear #1, #30 or #35, which was only popularized by Tony Esposito begining in 1969-70, and numbers such as Don Beaupre's #33, Ken Dryden's #29 or Gilles Meloche's #27 were out of the ordinary. We don't recall any regular skaters wearing anything higher than #29 when we were kids in the early 1970's. Then we became aware of fringe players wearing numbers in the 30's, which looked odd to us. And then came the Phil Esposito trade to the New York Rangers in 1975. 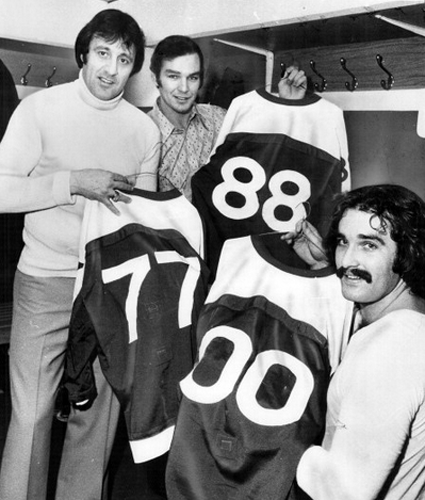 Esposito wore #7 with the Bruins, but when he arrived in Manhattan, #7 was already being worn by veteran Rod Gilbert, and Esposito doubled his #7 and became #77, while Ken Hodge did the same and became #88. There certainly may have been earlier examples of unusually high numbers, but for my then 13 year old mind, it was the first time I was aware of numbers over 35 for anyone. #99 was so far out of the norm and seemed to open the floodgates for "football numbers" in our teenaged recollection. 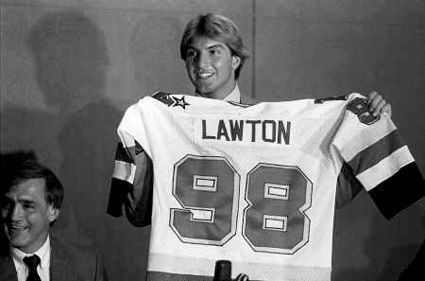 Brian Lawton followed with the unfortunate choice of #98, which would prove impossible to live up to due to it's implied expectations of being so close to Gretzky's #99. Mario Lemieux arrived bearing #66. Eric Lindros made #88 famous. Steve Heinze donned #57, as in Heinz 57 ketchup. 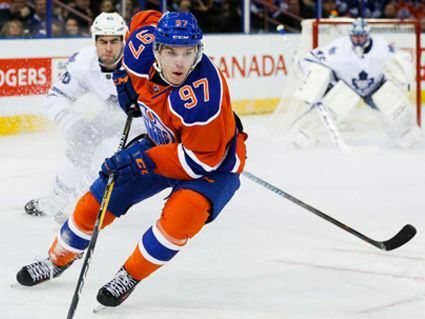 Certain players found their preferred number taken and swapped digits leading to even more numbers which would be more at home on a linebacker than a goaltender. 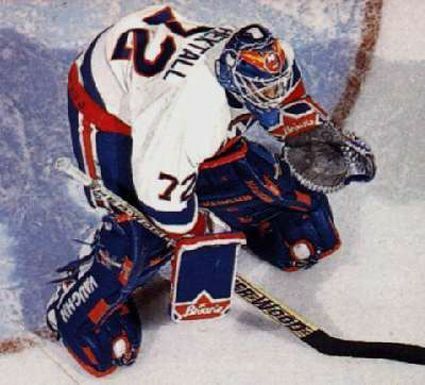 Ron Hextall's #27 was in use on Long Island, and he began to wear #72. 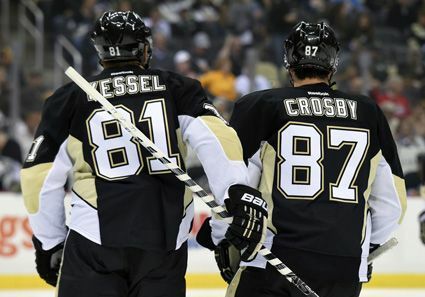 Now high numbers are obviously here to stay, especially when stars such as Rick Nash (#61), Phil Kessel (#81) and, of course, Sidney Crosby and his #87 all came into the league wearing high digits and making them their own right from the start, rather than switching to them mid-career for various reasons like Esposito, Hodge, Hextall and Ray Bourque all did. 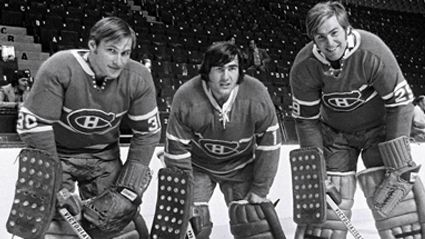 The storied and traditional Montreal Canadiens have now retired so many numbers that the players have little choice in the matter. With 1, 2, 3, 4, 5, 7, 9, 10, 12, 16, 18, 19, 23, 29 and 33 all out of circulation, the Canadiens last season featured a roster with decidedly un-traditional numbers such as 40, 41, 42, 43, 44, 45, 51, 52, 53, 54, 67, 71, 74, 76, 77, 79, 81, 85 and 89 - 19 out of 45 players wearing #40 and above. Compare that to the 1967-68 team, during the first year of expansion, when the highest number on the team was goaltender Rogie Vachon at #30 and no skater wore anything higher than #26. Jump ahead another 10 years to 1977-78 and Rod Schutt with #30 and Pat Hughes with #31 were the only skaters out of the 20's. 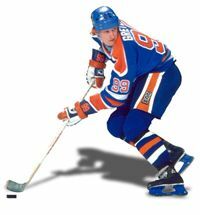 Ten more years shows the trend creeping upwards, thanks in part to the influence of Gretzky who arrived in the NHL in 1979. The 1987-88 Canadiens now had John Kordic #31, Claude Lemieux #32, Mike McPhee #35, Sergio Momesso #36, Mike Lalor #38, Brian Skrudland #39, Vincent Riendeau #40 and Stephane Richer #44 on the roster for a total of 8 "high numbers", but you will note they are all still under #50. 1997-98 shows #34, #37, #38, goalie #41, #43, #44, #46, #48, #49, #51, #52, #55 and #71 for 13 high numbers and seven of those higher than any seen in 1988. 2007-08 saw numbers 31, 32, 36, 39, 40, 41, 44, 45, 46, 51, 54, 70, 71, 73, 74, 79 and 84 for 17 high numbers now in use and four of those higher than anything a decade earlier, which brings us to today with the "football numbers" in the 40's, 50's, 60's, 70's, 80's and even now the 90's now being commonplace, as Ryan O'Reilly #90, Tyler Seguin #91and Steven Stamkos #91 all choosing numbers in the 90's and Vladimir Tarasenko #91, Evgeny Kuznetsov #92, Gabriel Landeskog #92, Ryan Nugent-Hopkins #93, Mika Zibinejad #93 and Connor McDavid #97 all taking numbers from the year they were born. 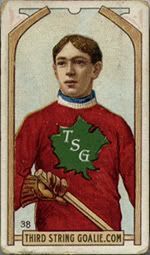 In case you were wondering, the Third String Goalie collection has all the numbers from #1 through #42 (as partially proven during our July by the Numbers theme), followed by numbers 44, 61, 66, 68, 71, 77, 80, 81, 83, 84, 87, 88, 89, 91, 92, 95, 96, 97 99 and 00 (which our database treats the same as "100"). We'd love to add a Neil Sheehy #0 Hartford Whalers jersey some day. 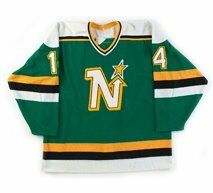 Here are some fun and interesting links related to hockey jersey numbers for you to check out today. The A-Z Encyclopedia of Ice Hockey Jersey/Shirt Numbers (shirt? Please, it's a "jersey" or a "sweater"!) has a lot of information, but sadly, was last updated after the 2007-08 season. 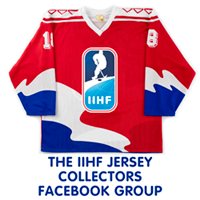 This includes all the players who wore a particular number of your choosing, which players have had a particular number retired (an exhaustive list that includes leagues other than the NHL) and some odd-ball numbers including #0, #00 and a few three digit numbers from primarily European leagues, but again it hasn't been updated since July of 2008. HockeyDB.com The Internet Hockey Database is another fairly good source for jersey numbers in addition to their excellent player stats. They don't always have the numbers listed, but often enough to be a valuable resource for who wore what when. JerseyDatabase.com - Not limited to just hockey, this is a great way to lose a day of your life. With the advanced search feature you do have the ability to search for a particular number in a particular league, such as the good ol' NHL, but you get to see the jerseys the player in question wore with all manner of functionality for the images you find. When Guillaume Latendresse took to the ice wearing #84 for the Montreal Canadiens in 2006, it was the last unworn number in NHL history, spawning a Sports Illustrated.com article, The Top 101, listing the best player to have ever worn each number from #00, #0 and #1 to 99, 101 in all. You may not always agree with the choices, Marian Gaborik's mere two weeks wearing #82 over Martin Straka?, and some players are "the best" because they are the only one to have worn a specific obscure number. If you find lists like that fun, perhaps this book is for you, By the Numbers: From 00 to 99. It's often a frustrating book, as many of the players are pictured wearing a different number than the one being discussed, but still more fun than the single player per number list on the SI.com article, since they list the other significant players who shared the number with their chosen favorite and some stories about why certain players chose their numbers, which we always find interesting, unless it's the boring "that's the number they gave me and I'm just happy to be here" line. Our favorite reasoning belongs to Sheehy, who claimed he wore #0 because "zero is the furthest number from 99, and talent-wise, I was as far away from 99 as possible!" 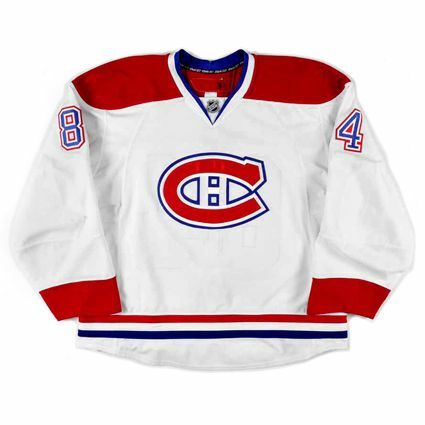 Today's featured jersey is a 2007-08 Montreal Canadiens Guillaume Latendresse jersey. 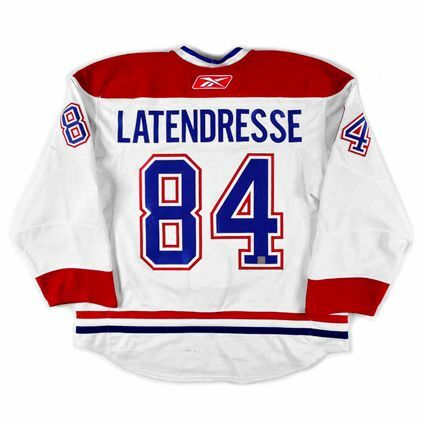 When Latendresse first donned #84, it was the final jersey number between 0 and 99 to finally be worn in the NHL, which triggered any number of online lists and even books listing the best player to have worn each number in NHL history. 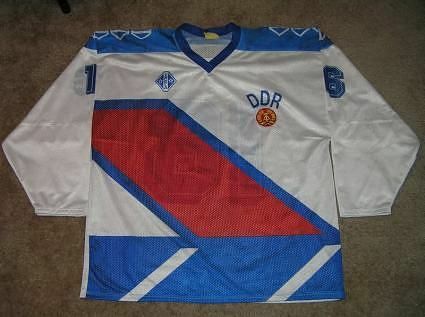 www.hockey-reference.com also has a very good jersey database. Two O-6 teams beat (or joined) the Rangers there. In 1979, the Red Wings - who before this had already assigned a few goalies #35, including Eddie Giacomin - gave Rogie Vachon #40. Then in 1981, Toronto assigned Ron Zanussi #39; this must have seemed odd to their fans, since the Leafs were so staid in uniform matters that they had famously attempted to thwart the league's requirement to put player names on jerseys by lettering them in the same color as their sweaters. In Boston, it was Cleon Daskalakis (#35) and Dave Reid (#36) who broke the number line, in 1985. The Blackhawks were the final holdout - they didn't have anyone take a number higher than Tony O until the '87-'88 season, when Darren Pang wore #40. As a Californian who first started watching hockey in the late 60's, I used to find the hockey numbers fascinating.....especially the goalies always being 1 or 30. Teams rarely used more than 2 goalies all season then, so it was always weird when a team had to bring in a 3rd goalie, almost always wearing 29 or 31. Only forward I remember with a number below 7 was Le Gros Bill, Jean Beliveau of the Canadiens with number 4. Today, I understand why there have to be so many high numbers with all the retired numbers, especially for Original 6 teams....but I still can't help think of anyone in the 50 thru 80 range as a training camp scrub. My advice...if you can't get below 50, ask for 80 or above.